So when the last time your partner kissed you “good morning” and gave you a loving look, where is it that you actually felt the ‘I’m in love’ emotion? Whether it is butterflies in stomach (anxiety) or the puffin up of the chest (pride), these emotions are universally associated with certain bodily sensations. 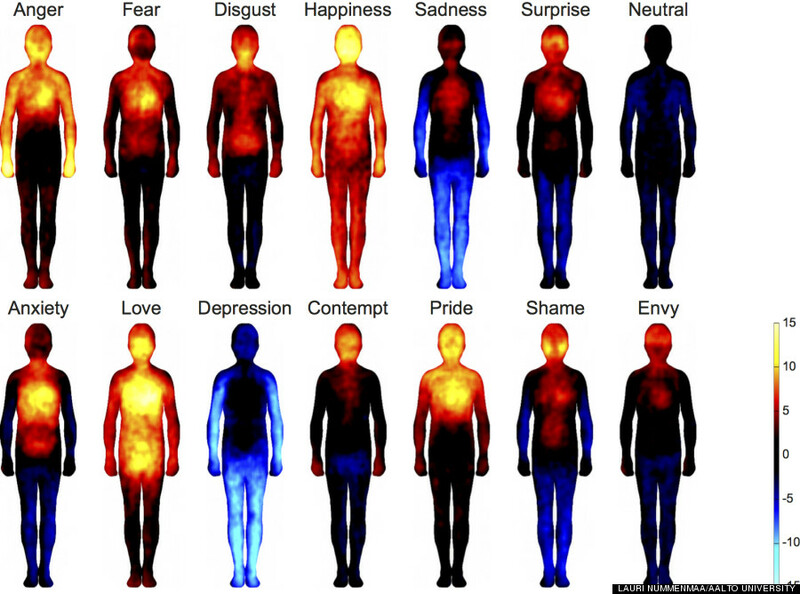 Based on where these emotions are felt inside our bodies, Finnish researchers mapped the emotions that the body went through. The study, with over 700 participants from Finland, Sweden and Taiwan, were asked to view emotion-laden words, videos, facial expressions and stories. They reported distinct areas of their bodies that felt different before they viewed the material. In two, coloured computer-generated silhouettes, one to note the area of increased bodily sensation while the other to mark areas of dampened sensation, participants were asked to provide their insights on how they felt (or didn’t) and where. The participants reported that when they felt ‘happy’ and ‘in love’, there was a sparkling activity all over their body whereas depression had the exact opposite effect. The results showed that basic emotions such as anger and fear affected the upper chest area, while happiness and love showed an increased sensation all over the body. The participants reported that when they felt ‘happy’ and ‘in love’ there was a sparkling activity all over their body whereas depression had the exact opposite effect as it decreased the sensations to nearly zero in the arms, legs and head. Fear and danger affected the chest area whereas anger activated the arms. The results of this study have enhanced researchers’ knowledge of understanding how humans process emotions. What’s even more interesting to note is that despite various culture and linguistic differences, our bodies react consistently to various emotions. Perhaps, that is why a smile means the same in every culture and language. So do tears. The researchers believe that further improvisation in such studies may help them map all emotions and identify newer ways to treat emotional disorders in human beings. With this new finding, the world seems to have become even smaller. And simpler. No matter what culture, language or nationality you belong to, biologically speaking, our mind-body connection and the emotions we feel and how they affect us physiologically is universal. Perhaps, this is what most ancient scriptures have also suggested: how we are one despite our conditional differences. Antonio Damasio, a neuroscientist who wasn’t a part of this study, said that he was delighted to see Nummenmaa’s findings because they offer deeper insights into what he has been suggesting for years. Emotions activate a distinct set of body parts, he explained, and the mind’s recognition of those patterns helps us identify that emotion consciously. Damasio goes on to say, “People look at emotions as something in relation to other people. But they also have a lot to do with how we deal with our environment – its threats and opportunities. Next Next post: OhLive, guys!